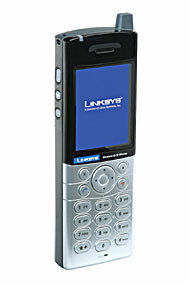 Linksys WIP330 Wireless IP Phone allows high-quality voice over IP (VoIP) service through a Wireless-G network and high-speed Internet connection. Linksys WIP330 features peer-to-peer dialing, speed dial, 3-way conferencing, call waiting, call transfer, and call forward, mute, hold and selectable ringtones, plus large, full-color high resolution LCD display, built-in web browser and live video streaming from any web camera such as the Linksys WVC54GC Wireless-G Internet Video Camera. WIP330 handset stores last 20 call history records and can save 250 phone book entries. Beside, ringtones can be personalized.